Muay Thai Shorts?! Do I really need them? Nothing can be so painful like clashes between the shin and other boney body part,which is why any kick-boxer will appreciate the value of a quality Shin guard. In this article, we will discuss how to pick the best muay thai shin guards. For you to excel in Muay Thai training, you will require few muay thai training gear that are crucial and help you avoid indjuries. One of the equipment you will need is shin guards. Other equipment includes hand wraps and gloves. For effective and safe training, shin guards are necessity. Shin guards are important for beginners since they need to control mobility. Nevertheless, even pro Muay Thai kick-boxers will need these guards for effective training. Whether you are a Muay Thai beginner or pro, the first equipment that any Muay Thai instructor will request is shin guards. There is no way you can get a go ahead without them,when it comes to sparring sessions. The shin guards protect your shin as well provide the comfort and mobility required. While fit has to deal with comfort or perfect fit. For the utmost performance and comfort, you need to pick guards that are sized properly. Muay Thai shin that fits perfect won’t need adjustment. Too tight Muay Thai Shin Guard will be uncomfortable to wear, and can lead to mobility problems. One of the things you should consider when picking a shin guard is fit and size fit. You need to select best muay thai shin guards that fit perfectly. Shin guards come in several sizes from small, medium, large or extra large. Therefore, the smaller your calves are the smaller size you will need. If you purchase bigger shin guards and the calves are smaller,you have to keep readjusting them constantly, which will not only cause discomfort but lack of mobility too. If the guards fit too tightly, you will be uncomfortable and in case they are too small, you at risk of getting injured. Thus, you should look Muay Thai guards that are comfortable to wear. The size of shin guards varies from one brand to another. You will have to try a few brands, to find the perfect size. You should go for the right fit and size! One of the major uses of shin guards is to provide protection. For more protection look for wider shin guards as they tend to protect almost every part of your legs. The drawback of such Muay thai shin is bulkiness, thus slowing the mobility. For faster movements, you will need narrower shin guards. With narrower shin guards, there is a likelihood of being injured. A thicker shin pad aids in providing better protection. Find shin guards with good protection! You should choose the shin guards that offer ample protection and you feel comfortable training and sparring in. No one can appreciate sparring with someone with shin guards that lacks a lot of padding and protection from kicks. While right fitting and protection are crucial, if you cant move freely to execute you kicks properly then it defeats the training purpose. Proper muay thai shin guards will have various anchor straps- one at the calf,ankle and under your foot or an entire sock like elastic to draw it on. These tend to fit well and doesnt move about while you’re sparring. Go with leather! Leather shin guards are most popular. Most people prefer genuine/ quality leather shin guards as there are long lasting. 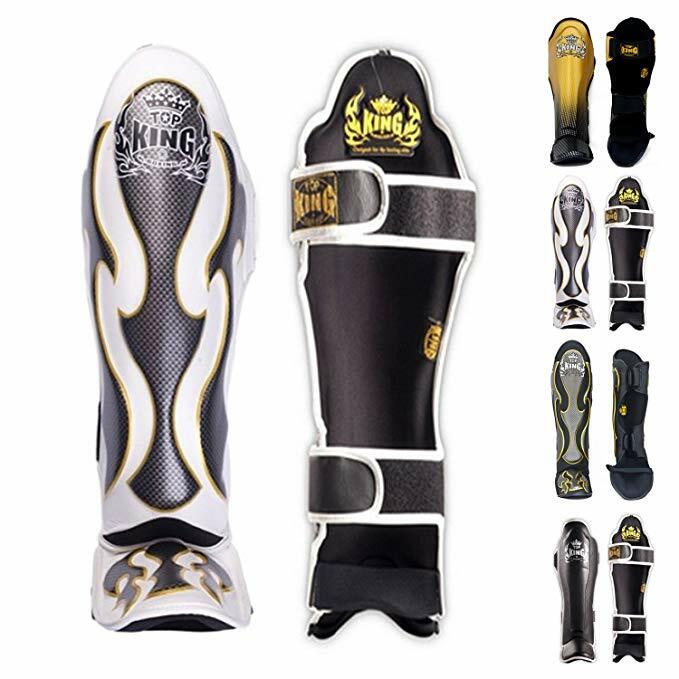 Genuine leather shin guards are most popular when it comes to purchasing Muay Thai guards. Even though in most cases genuine leather Thai shin guards are more durable, high quality synthetic leather can also last longer. Synthetic leather guards come in various options in terms of range of colors and flashier design. Synthetic leather guard is the best option for vegan. Shin guards socks features sock-like sleeve. For you to attach them,you one need to place the shin and foot down via the sleeve. Muay Thai shin guard socks as they are tighter as compared to strap guards. You won’t have to adjust the guards often, as the socks guards comes with minimal movement. Even though shin guard socks provides less protect as compared to strap version, they are excellent choice for wearing during training because of their cozy fit, lightweight and comfort features. The most popular of the two is straps shin guards. The straps shin guards provide ample protection for both fighters. With straps shin guards , you get ample protection along the shin as well as top of the foot. As compared to sock guards, these guards provide more protection. Due to their ability to offer more protection, they are popular among trainees and sparer. Straps (series of them) holds the actual shin guard front. These are more traditional and offer more protection than the sock type shin guards. But if you ever walk into a serious muay thai gym these are what every ones wearing when they are sparring, why? because they are easy to take off and on compared to sock style and they are easier to clean and dry off. 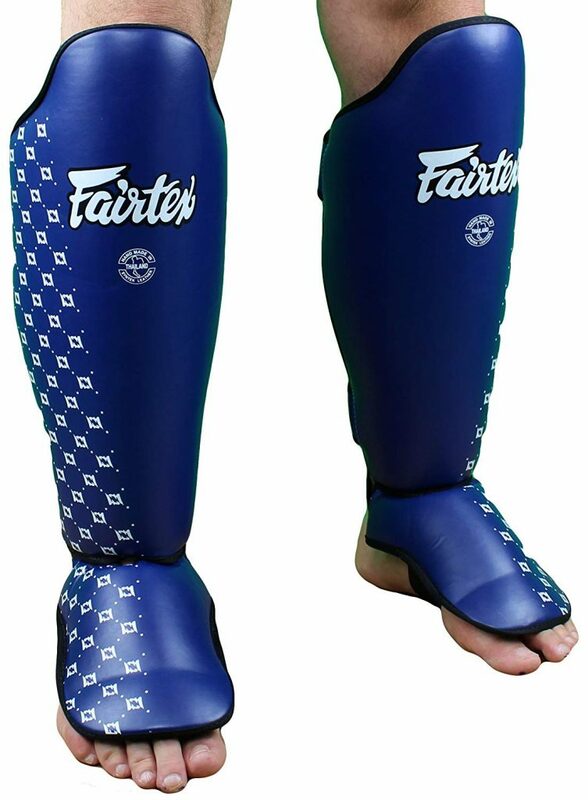 Fairtex is a popular popular shin guard company. Not only does this company produces the best protective gear, but also high quality Thai shin guards. Fairtex Competition guards mainly focuses on the mobility, comfort, protection and safety of every single person who trains Muay Shin. The guards come with several remarkable features such as lightweight design, comfort, synthetic leather covers and are made of high-density foam. With such a lightweight shin guard, you don’t need to sacrifice your mobility. If you are an extremely aggressive Muay Thai trainer, Fairtex Muay shin guards is an excellent choice. Hayabusa T3 is another one of the best shin guards in the market. These guards are well known when it comes to mobility, lightweight, and comfort. The guards feature ergonomic design, which improves the performance. You are provided with adequate protection when training as the guards comes with enough shins and legs coverage. Impressive lightweight construction, flexibility, and open backs are the notable features that the shin guards popular. Looking for best shin guards? Huyabusa T3 guards are recommendable. Top king guards are well known! They are rank among the best Muay Shin Guards from Amazon. One of the things that make them excellent choice is the good leg coverage. The guards cover the shins completely! The high density foam padding helps to provide more protection. You don’t have to worry about perfect fitting as the guards features a hook and loop strap feature. Another key feature is the sleek silhouette! As compared to other brands this shin guards fit and look better. In addition, they are less bulky, thus providing the required mobility. The remarkable dual tribal accents feature adds aesthetic touch while providing more protection. The only drawback that comes with the guards design is less protection on the sides of the lower legs. As compared to Fairtex and top king. The twin special is lighter, thus providing better mobility. However, the protection is less adequate. Nevertheless, they are among the top best Thai shin guards in the market today. Not only is twin special guard extremely durable, but also high quality. As for aesthetics feature, Twins shin SGL-2 guards are plain and simple. 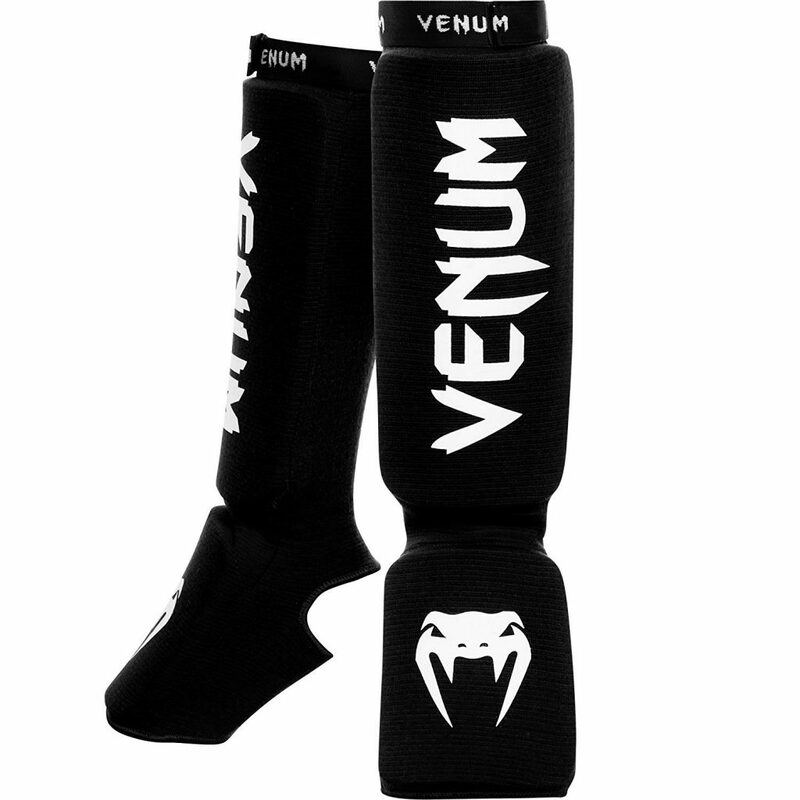 If you like colored shin guards, then Venum should be your pick. Venum Elite shin guards are well known due to their loud colors. Even with their eye-catching aesthetics, they rank among the best Muay Shin Guards in the market today. The shins are of high quality as they are made from high-grade synthetic leather. The Muay Thai guards come with a number of key features such as dense dual foam padding for protection and lightweight design for better mobility. The foot is padded to provide more protection. In addition, this shin guards features extra wide double Velcro straps for secure and stable fit. One of the equipment you will need as a Muay Thai trainee is shin guard. Whether you are a pro, enthusiast or beginner, you need shin guards as one of the essential requirement for Muay Thai training. Picking the right shin guards can be a hard decision, especially with numerous shin guards in market. However, with numerous options to choose from, you can look for ideal shin guard in terms of needs, protection, and mobility among other factors. The above reviews of the top best Muay Thai guards will of great help in selecting the perfect shin guards. Ladies Here’s Why BJJ,Muay Thai,Boxing Will Save Your Life! Muay Thai Fighter Challenges Joaquin Montes To Bully Him!